With all the talk of the Tour de Fleece lately, I thought now would be a good time to share some of my spinning adventures. I wrote an entry quite a while back sharing my experience with building a DIY spindle. I couldn’t wait to give it a try, so I went to Knit Picks and grabbed a pack of their Bare Wool of the Andes roving. Unfortunately, I don’t have any pictures of my first spinning attempt. (I threw it away to run away from the failure, ha ha!) The second attempt was definitely better though! It was thicker than I wanted, sure, but it was more consistent. Once I got the hang of it, all I wanted to do was keep spinning. In fact, I spun half of what I had before I even noticed! Eventually, I went online and bought a new spindle. I suspect that my little DIY spindle isn’t balanced very well so I wanted to try something that was professionally made. It was a little overwhelming looking at all of the spindles available, but I finally decided on a Schacht Hi-Lo spindle. I liked that I had the option of spinning high or low whorl, and it had good ratings. I used up the last half of my roving the first day it arrived, and it was my best spin yet, though it wasn’t great by any means. But you know what, that’s fine. It was just cool to know that I’m capable of getting better at this after that terrifying first attempt. My latest goal is to try plying my little pile of singles into a finished yarn. I’m also wanting to give dyeing a try so I’ve been doing a lot of reading on that. I think my first attempt will be dip dyeing, but I’m really excited at the prospect of handpainted yarn. It’ll be a while before I’m feeling confident enough to try that, but until then, I’m going to have a lot of fun spinning my own special yarns. I’ll definitely be back to talk about my plying and dyeing attempts, but until then feel free to leave me a comment and let me know if you’ve ever tried handspinning or dyeing your own yarn. I’d love to hear any stories you have about your first attempts. Another three months gone! Time just keeps slipping by without me noticing, it seems, but I’m hoping these periods of blogging silence will soon be at an end. There are a lot of things going on in my life at the moment, but I’m taking steps to allow myself enough time to write again, even if it’s just a short post or two a week. This week, I wanted to share some pictures and info about a recent order I placed with Knit Picks. If you haven’t heard of them, they’re an awesome online store that sells yarn, knitting needles, crochet hooks, and tons of other handy tools for yarn-minded individuals. I’ve ordered a ton from them in the past, and I can tell you with utmost sincerity that I’ve never been disappointed in an item I’ve bought from them. Let me show you what I got this time! A new hand winder! 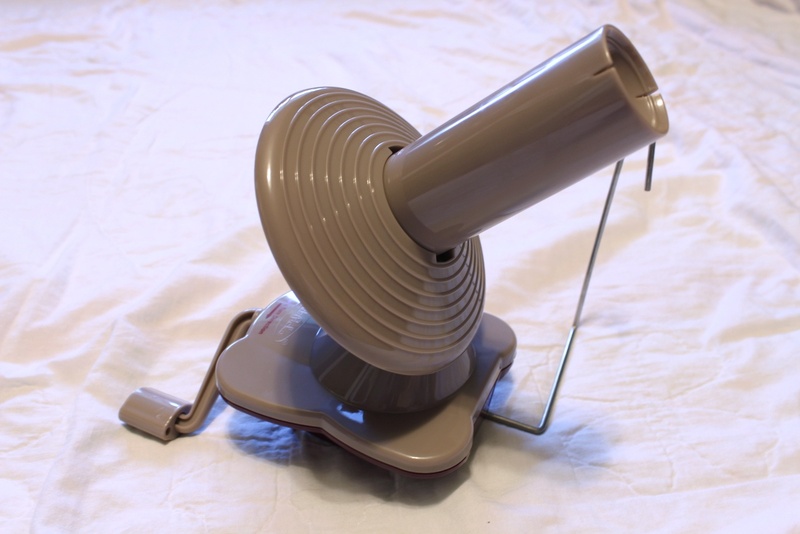 When I first started knitting and crocheting enough to need one, I bought a crappy Loops & Threads winder at Michael’s. That sucker was $30, but luckily I had a 50% off coupon at the time. Let me tell you, that thing has given me such a headache! It’s just not a great design, and I can’t tell you how many times T has teased me for mumbling angrily in the corner as I attempt to wind my yarn up into pretty little cakes. Another thing I noticed that made it way better for me is the Knit Picks winder has this particular way of rotating that winds the cake up all nice and neat with this pretty sort of criss-cross pattern. It seems like it winds tighter and neater than the Loops & Threads winder. 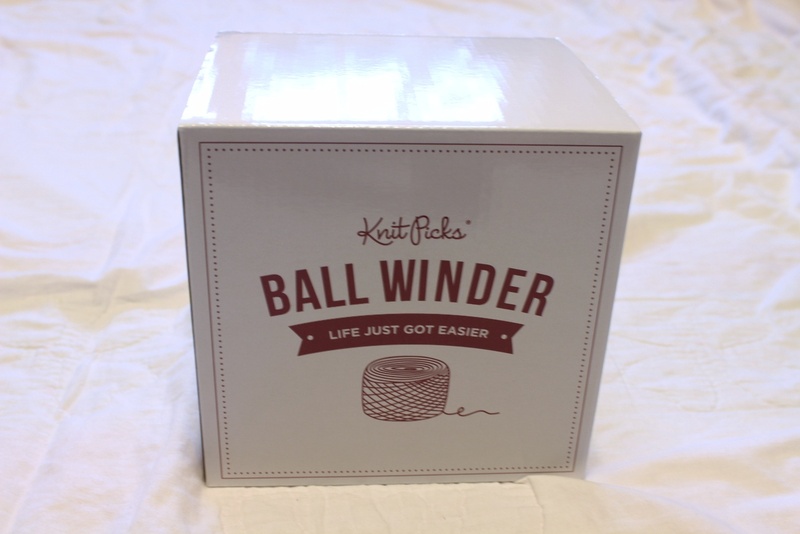 Last but not least, the Knit Picks winder was super affordable at $20 (plus shipping). You can get the Loops & Threads one for cheaper using a coupon as I did, but at the end of the day, I really wish I had just paid the extra $5 and gone for the Knit Picks brand. It would’ve saved me a ton of time and headache. Next, I decided to splurge and buy a swift! If you don’t know what a swift is, it’s a tool for holding yarn that you’ve bought by the hank (or spun yourself) as you wind it. It expands using a mechanism similar to an umbrella, and it spins freely to allow you to easily wind your yarn without worrying about tangling. I’ve been hand-spinning quite a bit recently, and I have a couple hanks of yarn ready to be wound. I’ve put it off until now because I was afraid of knotting all my hard work up, but it won’t be a problem with this swift around! Lastly, Knit Picks was having a special where you get a free hank of yarn if you spend $50 or more. I chose this beautiful lace weight yarn. The line is Shadow and the color is Tidepool Heather. It’s 100% merino wool, and it’s amazingly soft. I can’t wait to make something with this. I have a project picked out, but it’ll have to wait until I finish some of my current WIPs. I’ve dabbled in colorwork a little bit in the past, knitting up little swatches of fair isle or striping, but I’ve never attempted to incorporate colorwork into a project. Colorwork kind of terrifies me, to be honest. I’m afraid to ruin a perfectly good project and hours of labor because I’ve made it halfway through a project only to realize that I miscounted my rows or stitches, my design is off, or some other knitting mishap like that. I know it’s silly to think that way because I’ll never make progress if I don’t try. Which is why I’ve decided stick my toes in the water and see how it feels. In my last post, I showed off my first attempts at colorwork with my striped beanie and my Overwatch hat. And now I regret being afraid of colorwork all this time! It was much simpler than I first thought it would be, and there weren’t any major hiccups. Of course, I wasn’t doing anything super advanced, but still, through this experience, I think I’ve overcome my aversion. Also, I’ve completely fallen in love with duplicate stitch! For those of you that aren’t familiar with the technique, it’s when you take a tapestry needle and make copies of (or duplicate) your knit stitches on top of your work using different colored yarn to make a design. It’s much simpler than intarsia or fair isle because you knit the item using just one color all the way through, then you come in later and add the design. I’ve had a ton of fun coming up with ideas for designs, and the Overwatch hat was so popular that I got a request for a custom piece! I probably won’t do any more pieces like this because it’s just too time consuming, especially considering some of the other things going on in my life right now. But it came out great so I wanted to post it! The recipient chose the colors and told me the designs they wanted so I did the best I could. They seemed super pleased with the work. I guess what I’m trying to say with this post is this: if you’ve never tried duplicate stitch before, you really ought to give it a shot. It’s amazing and the amount of things you can do with it is literally endless. For anyone who wants to try it, you can find a great video tutorial by Knit Purl Hunter here. Even though I told myself that I wouldn’t make handmade Christmas gifts this year, I ended up making some anyway. As before, I wanted to share them here since I’m really happy with how they came out. First, I made several bath poufs for my mother-in-law and grandmother-in-law. I packaged them with some facial masks, bubble bath, and bath salts. Unfortunately, the bath pouf in the picture isn’t one of the ones I gifted. I didn’t have time to take pictures of them. It’s the same pattern though! These cotton poufs are awesome though! The texture of the yarn scrubs really well and leaves you feeling super clean. Once you’ve used it, you can just throw it into the wash and they’re clean and ready to go next time. The pattern is just called “Bath Pouf“, and I used one skein of cotton yarn for each pouf. I’ve been really keen to write a few hat patterns lately, so I decided to make some hats to become more familiar with their construction. This particular hat has been in my library on Ravelry for a while now. I can’t believe I’m just now getting around to it! One of the coolest things about this pattern is the neat little pin-striping effect you get. I love finding new techniques for unique designs so I think I’ll be trying this on other projects! The pattern is All Grown Up Striped Slouch hat. I crocheted it with Caron Simply Soft and Lion Brand Heartland. The colors matched so well, and I feel like the difference in the fiber really added some interest! Last but not least, my colorwork debut! My brother-in-law loves the game Overwatch so I knew exactly what to make for him for Christmas! And he loved it, yay! I know he loved it because he wore it out in public… I know, right!? Clearly, this is my most successful gift to date! The body of the hat was made using the pattern Siksak, but I made the design myself and stitched it on using duplicate stitch. It was my first time ever trying duplicate stitch, but I’m in love with it. I never want to knit anything plain ever again! I used Caron Simply Soft for the whole thing. It came out so fluffy and warm! All in all, everyone seemed pleased with their Christmas gifts. I was so relieved to see how well they were received. So, friends, do you make gifts for Christmas? What do you think was the best and/or worst gift you ever gave? Looking forward to seeing your stories in the comments!